As things get going and Local Motors begins to make faster and faster steps forward, it is my intention to remain as grounded in user feedback as possible. 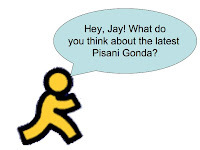 One of the tools that is at our disposal, which, so far, people in the community have not taken advantage of, is my AOL Instant Messenger (AIM) contact. With this anyone can have a direct line, and discussion can be more focused. If ever you have a need to ask a question, make a statement, or just chat about cars, I am often on line and would love to hear from you. The lines are open.... Let's talk cars. There are some papers at dissertation writing service . I think that its odd that in this article is the demonstration of perusing not accentuated. The way that youngsters today don't read is the genuine reason for this issue.